The world’s first 3D-printed bikini has gone on sale, created by designers Jenna Fizel and Mary Haung of Continuum Fashion. Called N12, the design comprises discs of varying sizes, linked together by springs. These circles are smaller on parts of the garment that need to curve round the body and larger on areas with flatter contours. The designers envisage that bespoke items of clothing could be made according to a body scan of the customer. The project was developed in collaboration with 3D-printing companyShapeways and can be purchased through the online shop. Photographs are by Ariel Efron. Designed by Continuum Fashion in collaboration with Shapeways the N12 if the first completely 3D-printed, ready-to-wear, item of clothing. Previous experiments into the use of 3D printing in clothing have remained purely experimental, haute couture items not available to purchase. This represents the first affordable design that will lead the way for more items fabricated using 3D printing technologies. The patterning starts with a curved surface, some geometry to indicate edges and value ranges for the circles sizes and tolerance parameters. The pattern begins placing circles at a point near the edge. Each subsequent circles tries to stay as near to the nearest edge geometry at possible. The circle’s size is determined with this nearness and by the local curvature of the surface. 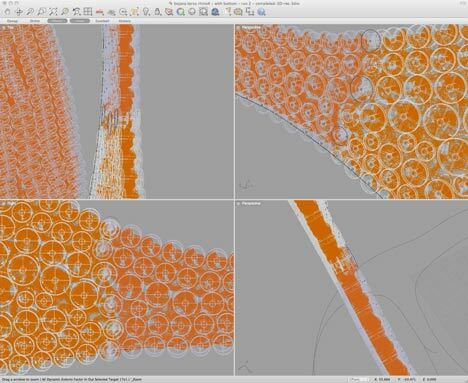 Curvier areas get small circles and flatter areas larger, both to help with accurately approximating the surface and to ensure flexibility where it is needed and efficiency of pattern where it is not. Every time a bend or elbow is encountered in the surface edge, a small gap will be left in the pattern. Gaps will also occur near the middle distances between edges where the placement of the next circle is less certain. After the first level of pattern has been created, these open areas are infilled with smaller circles to ensure complete coverage, and to create a more interesting aesthetic pattern. 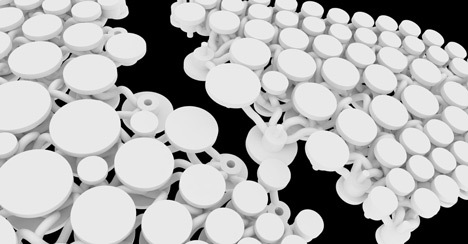 One of the goals of the circle patterning system is to be able to adapt it to any surface, at any size. This means that future articles of clothing can be produced using the same algorithm, this could be taken a step further into absolute customization by using a body scan to make a bespoke article of clothing, 3D printed to exactly fit that person only. Continuum Fashion is comprised of Jenna Fizel and Mary Haung. Jenna designs and programs interactive environments at Small Design Firm in Cambridge, MA. She has previously worked at KPF in computational geometry and has her BSAD in Architecture from MIT. Jenna is interested in reinterpreting traditional crafts and manufacturing using computational tools. Mary has a BA in Design and Media Arts from UCLA, and a MA from the Copenhagen Institute of Interaction Design (CIID). Most recently, she worked in interaction design at Local Projects in NYC. Her other notable work includes Rhyme & Reason–a collection of LED dresses, and TYPEFACE–a software piece combining facial recognition and typography. Shapeways is the online community and marketplace for personalized production where anyone can make and sell their own creations or buy custom‐made products, fabricated on demand in a variety of materials using the latest 3D printing technologies. 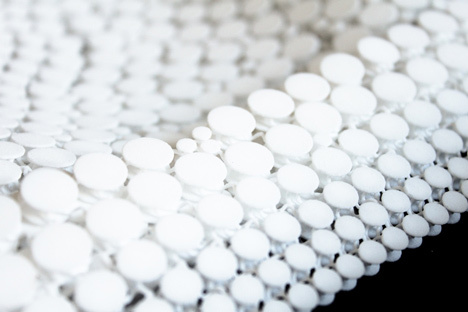 With headquarters in New York City and production facilities in Europe and the United States, Shapeways hosts a vibrant community of passionate creatives from around the world. Posted in Fashion and Clothing, Shapeways. Bookmark the permalink.